It may be a striking statement for many, but I hope that personal injury attorneys don’t have a job in the future. I love what I do. I help people in their time of need, argue against insurance companies, and I get to go to court. However, sometimes the job is hard. Recently, I was contacted by two different people who had family members, children or spouses, who had been in such severe car accidents that they were in the hospital and or the ICU. While I'm glad that I'm able to provide at least some comfort when I explain the process of making a personal injury claim, it's hard to stay positive while clients are dealing with such traumatic events. There is a lot of fear of automation because, supposedly, automation will leave many unemployed. There will no longer be a need for cashiers because of automatic checkouts. We will no longer need receptionists because everything will be done virtually. The entire industry dealing with car accidents will evaporate because of automatic and driverless cars. If all goes as planned, cars will drive themselves and humans won't be involved. With the human factor largely removed, car accidents will plummet. There will still be some litigation attorneys needed for when the machines malfunction, but the average car accident attorney will no longer be needed. There are murmurs of fear in other industries, and there are the same concerns among personal injury attorneys. Often, I hear, "How am I going to work if there are no more cases?" Personally, I hope that I no longer have a job because that means that people will be safer. The thought of eliminating car accidents and the pain and suffering that comes with them is an incredible dream. Never fearing a late-night phone call when your teenagers are supposed to be driving home or worrying how you are going to pay the bills after weeks in the ICU. I understand that there will be a huge inevitable disruption of jobs, employment, and the workforce in the years to come. I also understand that many people will be displaced, lose their ability to support their family the way they used to, and make massive changes in their day-to-day lives. All that said, I believe that preventing car accidents is worth the price of automation. Instead of being worried, I urge everybody to look at the benefits of automation. While of course there will be negatives, there will be positives as well. If it means that people are safer in the future, that is overall a great thing. What Should Personal Injury Attorneys Do? People will say to me, "James, what are we supposed to do? How will we survive?" I have those fears as well. The more research I do about legal software and technology, the more I realize that artificial intelligence may one day completely displace me. We need to focus on the positives. In our communities and families, we have people whose basic needs are not met. I believe that the healthcare industry is in a drastic need of revamping. We are in a situation where health care costs are far too high, and health care access is too low. We need to put the future workforce to use in the healthcare industry and apply technologies for higher productivity into that industry. We can make the lives of every person better by ensuring that everybody gets the health care that they need. I believe that it is our responsibility as a community and as a nation to ensure that we take care of people and allow them access to care which is instilled in our foundational values as human beings. I believe that future technologies will so be intertwined with our lives that there will be a fundamental need for security. We need to push to ensure that our children learn about these technologies and obtain the technical skills they need for the future. There is no doubt that the industry will have the new type of jobs that are like factory jobs for our former generations. I am confident that our future will bring new industries which we can only dream of today. We will rework our infrastructure to allow for much quicker mass transportation. We will reinforce our infrastructure in the way we live with each other. I'm hopeful that one day we will not only worry about the ease of living on earth but beyond. 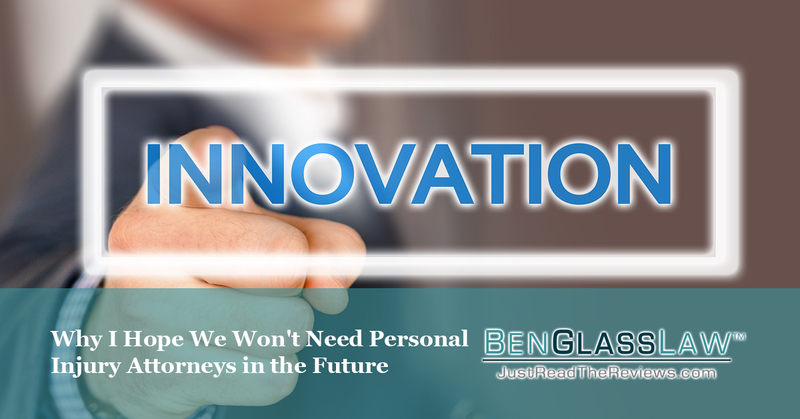 I understand that this article may not be what we typically do here at BenGlassLaw, but I look forward to the day that car accidents are a thing of the past. That means that people no longer have to stay in the hospital hoping that their loved one recovers from a serious car accident.